The ode Begin the Song! was composed in 1684, not for the court but for St Cecilia’s Day, whose public celebration Purcell had founded the previous year. On the saint’s festival, 22 November, was held a choral service, including a sermon in praise of sacred music, followed by a grand dinner and the performance of a newly commissioned ode. 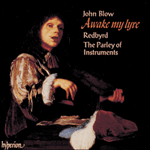 In 1684 the lot of composer fell to Blow, who was presented with a poem by John Oldham, focusing not, like most later Cecilian odes, on the properties of the various musical instruments but instead on the power of harmony to move the soul. 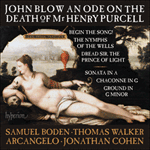 Blow responded with a work whose ambitious scale contrives to outdo Purcell’s first effort, Welcome to all the pleasures—though not too ostentatiously: the rivalry between the two composers was always friendly. An intriguing example of that rivalry is the final solo in the setting, ‘Music’s the cordial of a troubled breast’—obviously written for the celebrated deep bass John Gostling—which includes a repeated gradual descent, punctuated by rests, to a cavernous bottom D, at ‘calms the ruffling passions’. The passage is strikingly similar to one in Purcell’s contemporaneous, and marvellously vivid, symphony anthem They that go down to the sea in ships, at the words ‘so that the waves thereof are still’. Unfortunately, who on this occasion cribbed the idea from whom is not known. The other highlights of Blow’s setting are its imposing opening symphony, of which both sections display mastery of imitative counterpoint, and the duet ‘Hark how the waken’d strings resound’, finely wrought over a ground (reiterated) bass. Such structures had originated in Italy earlier in the century, and Italian examples were keenly studied in Restoration England. The movement is directly influenced by—or pays homage to—one in Welcome to all the pleasures, ‘Here the deities approve’, which includes a ground in the same key (E minor), finally blossoming in very similar fashion into a rich string ritornello. But Blow’s ground is longer and more complex than Purcell’s, and his ritornello, unlike its model, daringly permits the ground at one point to be shared by the bass with the inner parts—a highly original stroke, which Purcell did not emulate until a couple of years later. And make the strings to their own measures dance. To make the noble consort throng. For this is music’s sacred Jubilee. With tongue and fingers bears a part. And seem to antedate our future bliss on high. But for the charms which music lends! But for the pleasure which our art attends! And in the silent grave contented lie? And calms the ruffling passions of the mind. ’Tis that gives rapture to our love. ’Tis our chief bliss on earth, and half our heaven above. That graced this art, and gave this day its name. To bear a consort, and make up the choir.